Music, navigation, remote functionality, and smartphone integration are all table stakes for automakers. But the technology that (still) matters most to consumers concerns safety. In J.D. Power's new Tech Choice Study, three of the top five technologies that consumers most prefer in their next vehicle are related to collision protection. What the results of the study really show is that consumers are becoming more and more comfortable with the idea of trusting their car with more and more of those tasks, which is a good thing as we move toward the autonomous car. The inaugural study, which measures preference for and perceived value of 59 advanced vehicle features, divvies high-tech auto functionality into six major categories: entertainment and connectivity; comfort and convenience; collision protection; driving assistance; navigation; and energy efficiency. The features that consumers said they most want to see in their next vehicle are blind-spot detection and prevention systems, night vision, and enhanced collision mitigation systems. 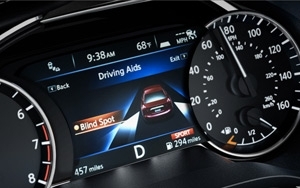 The only non-collision protection technologies in the top-five list are camera rearview mirror, which J.D. Power puts into the driving assistance category, and self-healing paint, in the “comfort and convenience” category. The study, based on a first-quarter 2015 online survey of more than 5,300 consumers who purchased or leased a new vehicle in the past five years, finds that price is the most important consideration point for all consumers, and across all in-car technology categories, accounting for 25.2% of importance. But price is far more of a sticking point for older shoppers, while Gen Y is willing to invest in geegaws and auto sentience. J.D. Power says Gen Y is willing to spend an average $3,703 on technology for their next vehicle; Gen X is willing to spend $3,007; and Boomers and pre-Boomers are willing to spend only $2,416 and $2,067, respectively. While blind-spot detection and prevention has high preference across the range of vehicle price segments, reverse auto braking systems have low preference across the vehicle price segments and preference wanes as vehicle prices increase. Advanced sensor technologies, such as hand gesture-controlled seats, biometric driver sensors or haptic touchscreens have low preference. Technologies in the navigation category have low preference across all vehicle price segments. Kristin Kolodge, executive director of driver interaction and HMI research at J.D. Power, said energy efficiency technologies are at the bottom of the consideration barrel, with features like active shutter grille vents and solar glass roofs garnering almost no interest. “Owners aren’t as enthusiastic about having these technologies in their next vehicle because of other efforts automakers are taking to improve fuel economy, as well as relatively low fuel prices at the present time,” she said in a statement.